Before looking, I will say 7. Okay...so that was way off. I guess the end of the space shuttle program put a huge damper on the number of people going up there to do science. That's a real shame. Hopefully SpaceX can up that ante again if/when the Falcon Heavy is cleared to begin manned flights. Ya, way lower than I would’ve guessed.... And only one American. 82 days, though! God bless those crazy fuckers. A trip through the solar system using the moon as 1 pixel for scale. Mountaineer Buc wrote: A trip through the solar system using the moon as 1 pixel for scale. "The fact that you're here, in the midst of all this nothing, is pretty amazing when you stop and think about it." When he said that, I could not agree more. Cudos to Josh Worth for putting that together because that must have took a VERY LONG time to put together. 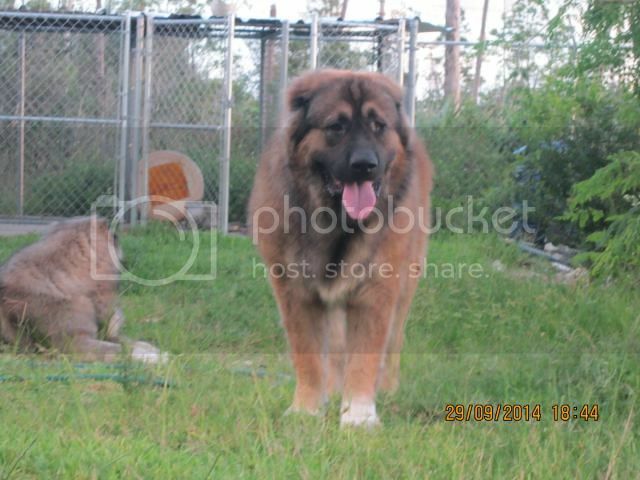 Last edited by bahamian:bucfan on Fri Mar 09, 2018 11:02 am, edited 1 time in total. I'm sure many here have seen this already but I always revert back to this when I think of the solar system and it's actual size. Will hyperloops become the next big transportation reality? Imagine zipping along at 760 mph from DC and arriving in NYC a half hour later for a little day shopping trip or to attend your company's monthly sales meeting. That would be pretty awesome. 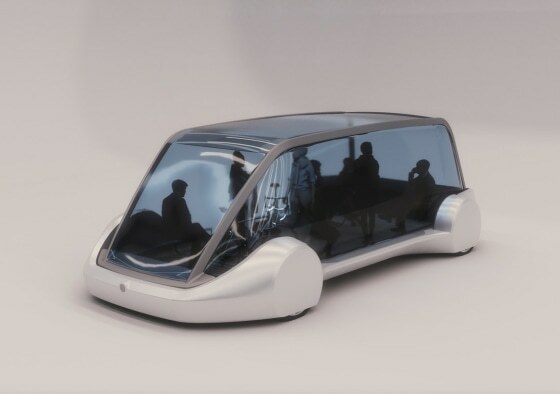 Elon Musk first described his idea for a futuristic transportation system that would send passenger pods through tubes at speeds of hundreds of miles an hour back in 2013. At the time, the idea of actually building and operating a so-called “hyperloop” seemed far-fetched, to say the least. But hyperloops are no longer quite so hypothetical. A handful of firms are now competing to develop the necessary technology. And in addition to designing the magnetically levitated pods and testing them on small-scale tracks, the firms are taking preliminary steps to set up hyperloop routes in the U.S. and abroad. “It’s happening far faster than I would have ever expected, and it’s happening all over the world,” said Dr. David Goldsmith, a transportation researcher at Virginia Tech. One of the biggest players is Musk himself. His whimsically named Boring Company is planning to dig a hyperloop tunnel that would make it possible to travel from Washington, D.C. to New York City in half an hour (the fastest Amtrak trains make the trip in just under three hours). Meanwhile, a pair of California-based startups, Virgin Hyperloop One and Hyperloop Transportation Technologies, are developing routes in North America, Asia, and Europe. But with roads in many areas badly congested and air travel subject to weather delays, high-speed tube travel sounds appealing to many. In addition to shaving hours off of intercity trips, hyperloops promise to be less polluting than planes and cars. And hyperloop travel could even transform the morning commute, potentially allowing workers to travel comfortably to worksites hundreds of miles away from their homes. Hyperloop routes would consist of steel tubes roughly 11 feet in diameter that would be positioned on the ground or, in Musk’s vision, in underground tunnels. Either way, the routes would have to be picked carefully both to avoid existing infrastructure like roads and buildings and to make sure the routes take no sharp turns that could subject passengers to unpleasant jolts. As for the pods, Hyperloop Transportation Technologies envisions 100-foot-long models fitted with virtual windows — video screens that would recreate the scenery outside — and capable of seating 40 passengers. Virgin Hyperloop One, meanwhile, has already built prototype pods fitted with leather seats and armrest-mounted entertainment screens. The pods would accelerate and decelerate gradually, moving from one station to the next without stopping. In short, hyperloop trips promise to be quiet and smooth — and very fast. Ultimately, hyperloop developers aim to develop systems that will move pods along at speeds of up to 760 miles per hour. So far, the fastest any prototype pod has traveled is 240 miles per hour. 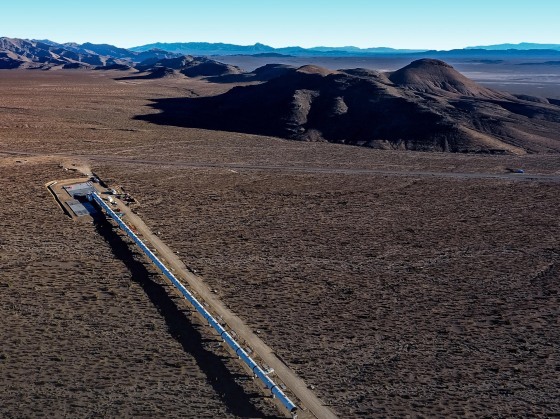 That came last December during a test run that Virgin Hyperloop One conducted in the Nevada desert. 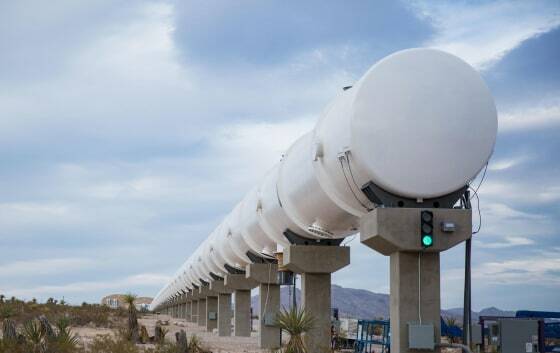 Virgin Hyperloop One hopes to begin testing full-sized hyperloop systems in 2021 and then to build hyperloops in the United Arab Emirates and India, among other countries. The company is also conducting feasibility studies for routes in Missouri and Colorado. Musk’s Boring Company has received a permit to begin excavating a possible hyperloop station in Washington, D.C. And Hyperloop Transportation Technologies is carrying out a feasibility study for a hyperloop linking Chicago and Cleveland and is considering routes in Europe, South Korea, and the United Arab Emirates. Among other things, the tests will show whether it’s possible to maintain the partial vacuum within the tubes over hundreds of miles and if airlocks can quickly and fully seal off the tubes when passengers exit a pod. 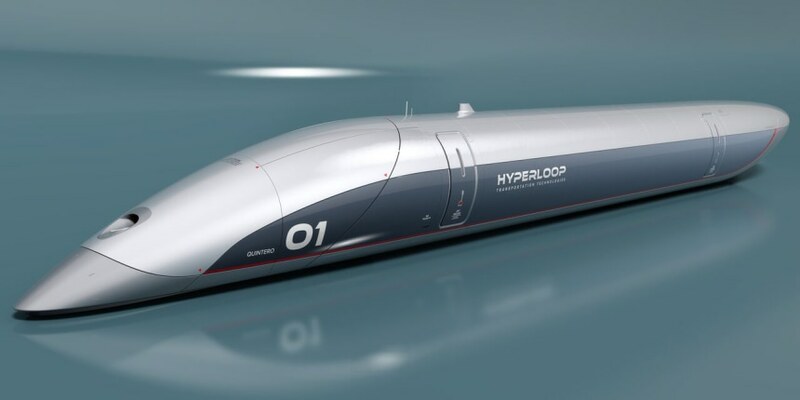 Once construction of commercial hyperloop routes begins, it’s likely to prove very costly. Some estimates suggest one mile of a hyperloop route could cost up to $121 million, Forbes reported. Obtaining land rights and environmental approval will complicate matters. So will the need to develop regulations and safety standards for a new form of transportation. “We really need to know a lot more about the safety features and what would happen if something went wrong,” Philippa Oldham, head of technology and manufacturing at the Institution of Mechanical Engineers in London, told The Guardian. Buc2 wrote: Will hyperloops become the next big transportation reality? Imagine zipping along at 760 mph from DC and arriving in NYC a half hour later for a little day shopping trip or to attend your company's monthly sales meeting. That would be pretty awesome. Not quit Space Taxi, but pretty exciting none the less. 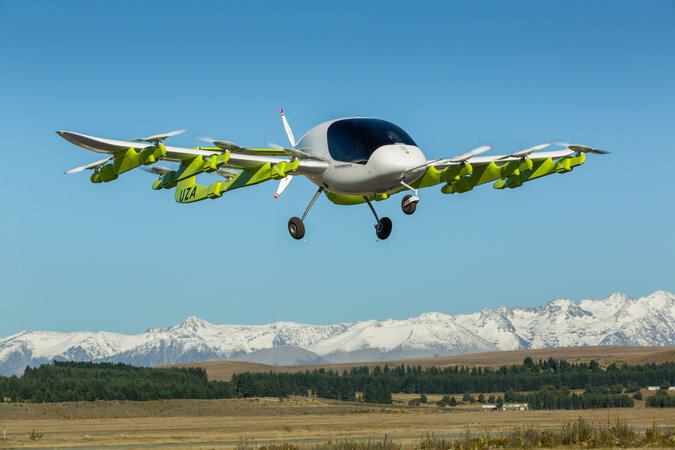 Eh, I'm in the aviation industry and I gotta say that as nifty as the concept is, I wouldn't be comfortable riding in something like that without someone or myself being able to manually override the computer for things like bad weather or some other malfunction. the #1 reason why so few people fly is is cost. It's a VERY expensive hobby. Both to get into and do. This is a Diamond DA40. Pretty much the best entry level aircraft you could ask for. Very stable, 180hp engine that gets good fuel economy, glass cockpit, great airplane to learn to fly on and a 10 year old one can run you $180,000. If you hangar it with me it's gonna run you $250 a month and as of this morning my fuel for it is $5.30 a gallon. And we haven't even gotten into the cost to learn to fly yet. Still. I'm not getting in that damned drone. Like it or not, autonomous vehicles is going to be the future. Whether or not it's a ground or air vehicle isn't going to matter. Looks like touchscreens and two-screen laptops are the future of computing and it's ready to happen now. Think you’ll hate laptops with screens instead of keyboards? Here are 5 reasons why you’ll love them. I’ve got good news and bad news about the future of laptops. The bad news: We’re all getting laptops that have a touchscreen on the bottom instead of a keyboard. I know. You hate the idea. That’s why it’s the bad news. The good news is that these touchscreen keyboards won’t look, act or work the way you think they will. In fact, I think you’ll love these devices. That’s why it’s the good news. At Apple’s Worldwide Developers Conference (WWDC), which it said this week will take place starting June 4 in San Jose, the company could announce an all-screen keyboard for the iPad — a replacement for the iPad Pro Smart Keyboard — and possibly a two-screen laptop. But even if it doesn’t, I believe Apple and other major laptop makers will evolve toward two-screen laptops over the next three years. I get it. You love typing on a real keyboard. So do I. In fact, I think just about everyone who’s heard about this idea hates it. But people are thinking about today’s on-screen keyboards and today’s laptops, powered by today’s technology. They’re not thinking about technology they haven’t seen or other ways of working with a device they haven’t tried. Another reason for the opposition is that two-screen laptops aren’t new. We’ve seen the idea tried in the past ten years in the form of Canova’s Dual-Screen Laptop, the Acer Iconia 6120 Dual Touchscreen Laptop, the Toshiba libretto W105-L251 7-Inch Dual Touchscreen Laptop and others. These devices were unpleasant to use and were rejected by laptop buyers. Future two-screen laptops will be the opposite. Here are five reasons why you’ll love two-screen laptops. 1. Touchscreen keyboards will feel like physical keyboards. Apple has been filing patents in this category for years. Two more Apple dual-screen laptop patent applications have been published in the past three weeks. 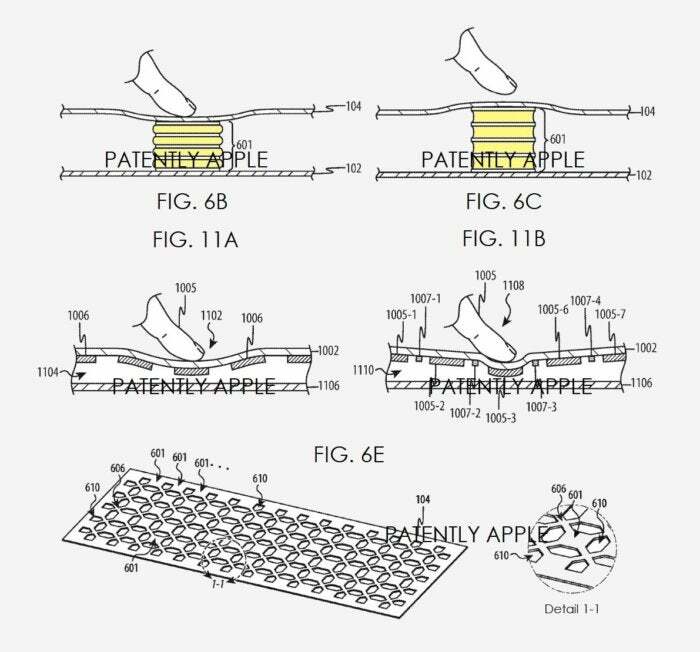 As mere patent applications, they don’t reveal Apple’s actual plans. However, they do serve as an example of how companies want to use advanced technology to make all-screen keyboards far more appealing. The most recent patent details different methods for making an on-screen keyboard feel like a physical one. Apple’s most recent two-screen laptop patent shows how flexible displays will enable on-screen keyboards with raised keys that can be physically pressed. Apple achieves this in part by using a flexible display, with a keyboard-like structure underneath. The on-screen keyboard would actually have key travel. In other words, it would be a hybrid of an on-screen keyboard and a physical keyboard. The “virtual” keys can be physically pressed, and they can also raise bumps on the screen when the virtual keyboard is on the screens. You’ll be able to feel where the keys are before you press them. It also describes the use of next-generation haptics that vibrate keys when they’re pressed with the simulated feeling of a physical keyboard. No doubt sound would be added as well to further simulate the experience of using a physical keyboard. Apple has for three years sold MacBook and MacBook Pro laptops that feature a “Force Touch” trackpad. Apple uses a “Taptic engine” (Apple’s branded haptic part) and electromagnets to simulate physical movement and trackpad clicking. A majority of users no doubt believe this trackpad moves, tilts and clicks. But it doesn’t move at all. Apple is using haptics to simulate movement. It can do the same thing with an on-screen keyboard, according to the patent application. Next-generation touchscreen laptop keyboards will have keys you can feel, press and hear. 2. Sometimes you don’t need a keyboard. Steve Jobs detailed the benefits of replacing physical keyboards with virtual ones in his 2007 introduction of the iPhone. The main benefits, of course, are that you get more screen real estate and also more flexible interface options. Apple’s patents show an iTunes and Apple Music interface that replaces the on-screen keyboard with music controls, such as an equalizer, when one of these applications is running. It’s easy also to imagine what kind of interfaces third-party developers could build: turntables for DJs, drawing pads for illustrators, advanced calculator keyboards for eggheads, speech notes for business presentations and game-specific game controls for games. During videoconferences, the keyboard could have chat windows and other data so the meeting could be full-screen. Musical applications such as Apple’s own Garage Band could get piano keyboards, drum kits, strings and more on the bottom of the screen. The most recent patent shows how the bottom screen can also display application-specific content or interfaces but instantly turn into a keyboard when you place your hands on it. I mentioned at the top that I think Apple’s first all-screen keyboard might be an even smarter iPad Pro Smart Keyboard than the company currently sells. Apple’s recent patent specifies an all-screen version for iPad. I also said it might announce a two-screen laptop. It would make sense for Apple to announce all-screen iPad keyboards and two-screen laptops at a developer event, because the value of this kind of laptop lies in what third-party developers do with them. The main benefit is custom, application-specific interfaces. So when Apple starts working on the manufacturing of such devices, it makes sense that we’ll hear about it in advance at a developer event so applications will be ready when they ship the hardware. Custom software keyboards, by the way, might prove especially powerful for enterprises that are doing in-house development of custom apps. There’s even a security element to this scenario. Locking down a system to reduce the attack surface might actually involve the removal or addition of keyboard interface options. As artificial intelligence (A.I.) evolves and is intelligently applied to future versions of Autocorrect, you’ll be able to get away with an increasing number of errors that will be accurately and instantly fixed. Browser plugins such as Grammarly show how writing can be improved with A.I. as you type. The frustration of using today’s on-screen keyboards will be replaced with the thrill of quickly typing on-screen without leaving errors behind. While dual-screen laptops will enable countless new options, the centrality of keyboards to our work will decline. Over time, we’ll get used to talking to our virtual assistants, and their agency will extend to the typing we do. Instead of sending and specifically wording an email, we’ll be able to talk and tell the assistant our intention and let A.I. do the actual crafting of the email. In fact, this is how business used to work when executives had secretaries. They didn’t type anything. They talked, and an assistant did the writing. A new Chrome extension that works with Gmail shipped this week that hints at the future of automated writing. Called EasyEmail, the extension uses machine learning to scan your previous writing and imitate your writing style. Then, when you’re writing an email, EasyEmail guesses what you’re going to write and offers those guesses as options to select. It often guesses entire sentences after you type the first word. EasyEmail is just an example of what’s emerging for automated writing. A.I. predictive writing will reduce the amount of typing we’ll do. Journalists and developers tend to be the most vocal critics and haters of the two-screen concept. But they should be the most enthusiastic. When doing serious writing or coding, you’ll always be able to choose any keyboard on the market and use it as a peripheral to your laptop. While you’re not using the bottom screen keyboard, that screen can be put to use displaying notes or any other content. For a writer, for example, having your prose on top and notes and resources on bottom is a better way to write. And developers can never get enough screen real estate while coding. In other words, a laptop without a physical keyboard does not mean you can’t use a physical keyboard. It simply means you have more keyboard choice and more screen real estate. Sooner or later, two-screen laptops are going to happen. One mechanism for this change is generational. Members of the so-called iGen generation, born between 1995 and 2012, have never known a time before smartphones. People now entering the workforce are iGens. They live on their phones, are more comfortable typing on a smartphone screen than a laptop physical screen, and will easily adapt to using two-screen laptops and on-screen keyboards at work. Every year, people more comfortable with physical keyboards will retire, and those who prefer screen keyboards will enter the workforce. But the biggest driver will be competitive advantage. In general, companies with the most advanced technologies benefit from shifting buyer expectations to products that require those advanced technologies. This increases barriers to entry by smaller competitors. After all, any two-bit, third-rate, bargain-basement company can build a mechanical keyboard. But only the top companies such as Apple, Google and a few others will be able to combine patented actuators, patented haptics and advanced A.I. to construct a keyboard. The main companies we buy laptops from have a powerful incentive to move into two-screen laptops. And finally, software is eating the world. As a rule of technological advancement, physical contraptions are generally replaced by software versions when the technology is ready. And guess what? It’s ready. I can imagine they'll be super expensive when they first come out. Laptops with just a touchscreen display are more expensive as is. Nano wrote: I can imagine they'll be super expensive when they first come out. Laptops with just a touchscreen display are more expensive as is. Oh for sure. New tech is always more expensive in the early years of release. The dominance of touch screens and apps that only use them is really going to screw blind people. Buc2 wrote: Oh for sure. New tech is always more expensive in the early years of release. Over the past couple months, teams from USA TODAY and FLORIDA TODAY have worked non-stop to blend technologies that will put you in control of a rocket launch from anywhere in the world. It arrives Thursday afternoon as 321 LAUNCH, a free app for iOS and Android that fuses traditional Space Coast rocket launch coverage with augmented reality, or the overlaying of digital objects onto the real world. The app leverages cameras available in smartphones and tablets to pull in a live feed of your surroundings while dropping spaceflight hardware – in this case, launch pads at Cape Canaveral Air Force Station – on any flat surface. Tables, floors, books, even a pizza – as long as it's flat, the app will render high-definition 3D models of launch pads and a SpaceX Falcon 9 rocket so you can learn, explore and, ultimately, follow live as a mission lifts off from the Space Coast. The first section of the app is an educational experience that runs through the pre-launch procedures and allows you to build a Falcon 9, drag it out to Launch Complex 40, learn about the hardware and launch it on a mission to the International Space Station. After liftoff, the experience shifts focus to landing the booster back at Cape Canaveral. * Live text updates from Space Reporter James Dean and myself. * Live video: Either ours viewing the pad or SpaceX's webcast. * Live telemetry data to include altitude and speed after liftoff. * And, using cutting-edge GPS and compass mapping technology, a projection of the actual flightpath over your sky. But the app isn't finished – we're still working hard on producing even more interactive content. You can expect a brand new section that focuses on a United Launch Alliance Atlas V rocket and its various configurations at Launch Complex 41 for our next update. When you move your device to get a close-up view of the launch complex and Falcon 9 rocket, you're using cutting-edge AR technology to do something no other app currently does. From the Dragon spacecraft to the nine Merlin main engines, the hardware and surrounding pad is rendered out in incredible detail – and you can do it anywhere. Full-fledged teams of developers, journalists and editors were involved in the production process, so we're proud to give you the opportunity to watch live as you bring rocket launches into your everyday life. And I can almost guarantee that everyone will learn at least a thing or two from the educational experience. I know I did. Augmented reality on mobile devices is still a cutting-edge technology that is actively being ironed out by Apple, Google and others. You'll need a newer device to pull this off and possibly even a backup battery to feed energy-intensive AR processes. Illustration of NASA's Low-Boom Flight Demonstration aircraft as outlined during the project's preliminary design review in 2017. NASA has selected Lockheed Martin to build the new supersonic jet. A diagram shows the orbit of asteroid 2018 GE3, which flew by Earth on April 15, 2018. This newfound asteroid is three to six times as big as another recent meteor, the one that broke up over Chelyabinsk, Russia, in 2013. That object injured more than 1,200 people and damaged thousands of buildings up to 58 miles (93 km) away from the impact site. "If 2018 GE3 had hit Earth, it would have caused regional, not global, damage, and might have disintegrated in the atmosphere before reaching the ground," SpaceWeather.com reported. "Nevertheless, it is a significant asteroid, illustrating how even large space rocks can still take us by surprise. 2018 GE3 was found less than a day before its closest approach." The asteroid 2018 GE3 was first spotted on Saturday (April 14) at 5:23 a.m. EDT (0923 GMT) by astronomers at the Catalina Sky Survey, a NASA-sponsored program based at the University of Arizona in Tucson. This first sighting occurred just 21 hours before the asteroid's closest approach to Earth. Called the Akademik Lomonosov, the floating power plant is being towed at a creeping pace out of St. Petersburg, where it was built over the last nine years. It will eventually be brought northward, to Murmansk – where its two nuclear reactors will be loaded with nuclear fuel and started up this fall. From there, the power plant will be pulled to a mooring berth in the Arctic port of Pevek, in far northeast Russia. There, it will be wired into the infrastructure so it can replace an existing nuclear power installment on land. 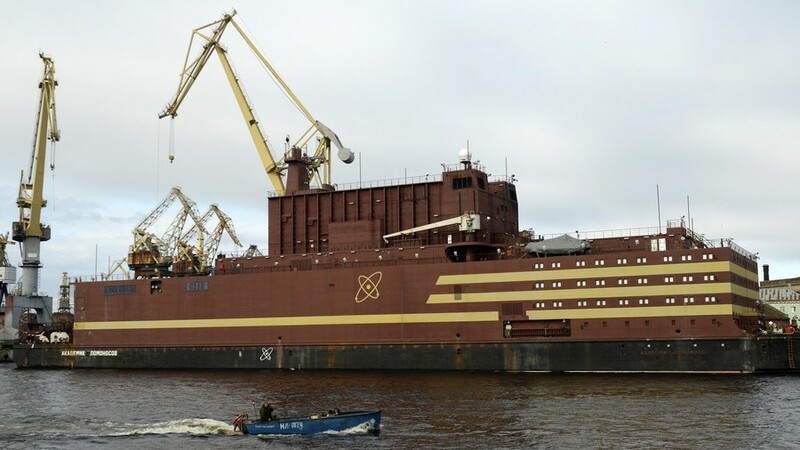 Critics of the plan include Greenpeace, which recently warned of a "Chernobyl on ice" if Russia's plans to create a fleet of floating nuclear power stations result in a catastrophe. An artist's rendering of a Kilopower nuclear power plant on the surface of the moon. The prominent heat radiator makes it look like a beach umbrella. The actual unit will have cables carrying electricity away from the reactor. Scientists, engineers and reporters gathered at NASA's Glenn Research Center in Cleveland on May 2 for a news conference announcing the latest results of the Kilopower nuclear power plant project: It has finished all of its major ground tests and met or surpassed the development team's expectations. NASA is developing the experimental reactor to provide reliable energy for long-duration crewed missions to the moon, Mars and destinations beyond. In spacecraft like the Voyagers and Curiosity, a device called a radioisotope thermoelectric generator (RTG) converts heat energy from passive radioactive decay directly into electricity. The decay causes a temperature difference across plates of two kinds of metal — one connected to the reactor, and the other attached to a radiator, thereby producing a voltage. This component, called a thermocouple, is commonly used in thermometers and temperature sensors. Although RTGs are not particularly efficient, they are simple and have no moving parts, making them perfect for applications in which repair is not an option. But many future missions, especially those involving human crews, will require much more power than the RTGs can produce. That's why NASA and the U.S. Department of Energy (DOE) are collaborating to create a space-ready nuclear reactor, which harvests energy from active nuclear fission, or atom splitting. At the news conference, NASA and DOE officials announced the completion of successful ground tests of the experimental reactor, called the Kilopower Reactor Using Stirling Technology (KRUSTY). The team tested the reactor at the DOE Nevada National Security Site in four phases. The first two were conducted without power, to ensure that the components reacted as expected. During the third phase, the team gradually increased power to heat the core. The final phase consisted of a 28-hour, full-power test that simulated an actual mission. The team evaluated the reactor's startup sequence, steady state performance, efficiency and more. In each category, the test reactor met or exceeded the team's benchmarks, running at full power under vacuum conditions, according to Kilopower lead engineer Marc Gibson. "We threw everything we could at this reactor, in terms of nominal and off-normal operating scenarios, and KRUSTY passed with flying colors," said David Poston, chief reactor designer at the National Nuclear Security Administration's Los Alamos National Laboratory. Marc Gibson, Kilopower lead engineer at NASA's Glenn Research Center, and Jim Sanzi of Vantage Partners install equipment on KRUSTY (Kilopower Reactor Using Stirling Technology) at the Nevada National Security Site (NNSS). The significance of these results is hard to overstate, said Gibson. Research on space-ready fission reactors has been mired by high costs and lengthy time frames from the late 1970s to the early 2000s, which resulted in many canceled projects. "This is the first nuclear-powered operation of a new fission reactor concept in the U.S. in 40 years," Gibson said. Fission reactors have many practical advantages over RTGs. For instance, RTGs generally produce only a few hundred watts, but the reactor is scalable to 10,000 watts. Four units could provide enough power to establish an extraterrestrial outpost, according to a statement NASA released after the event. Another advantage is that, unlike an RTG, which runs continuously, a reactor's output can be tailored to current demands, Gibson said. That also means it can remain dormant during launch and travel and turn on once it reaches its destination. This ability, combined with the increased efficiency of fission reactors over RTGs, means that a Kilopower generator could maintain its 1-kilowatt output for at least 10 years, NASA officials said in the statement. The system works like a thermostat, where feedback keeps the device at a preset temperature, Poston said. If the reactor overheats, the Stirling engines that produce electricity draw more heat from the uranium core. If it is too cool, the core naturally contracts, trapping more free neutrons, which then increases the rate of fission. Responding to concerns over Russia's recently launched, floating nuclear power plant, Poston explained that the reactor will pose little or no risk to the public. NASA follows all relevant protocols, including those set out by the United Nations, he said. Additionally, the reactor will not be turned on until it is far away from Earth. "We've done calculations to show that, under all worst-case conditions, we don't believe that there's any chance the reactor would come on accidentally, [even] during a launch accident," Poston said. The team has also considered safety at the reactor site. Engineers at NASA's Johnson Space Center are designing containers to safely store spent fuel on-site, since returning it to Earth would not be practical, said Patrick Cahalane, the principal deputy associate administrator for safety, infrastructure and operations at the National Nuclear Security Administration. The reactors have no radioactive coolant that would pose a contamination risk, and the development team is researching mechanisms to shield astronauts from radiation that the reactor may emit, including building in protection and burying part of the reactor under the surface. Although the prototype isn't the same as units that will be deployed into space, it was designed with the flight-unit in mind, Gibson said. 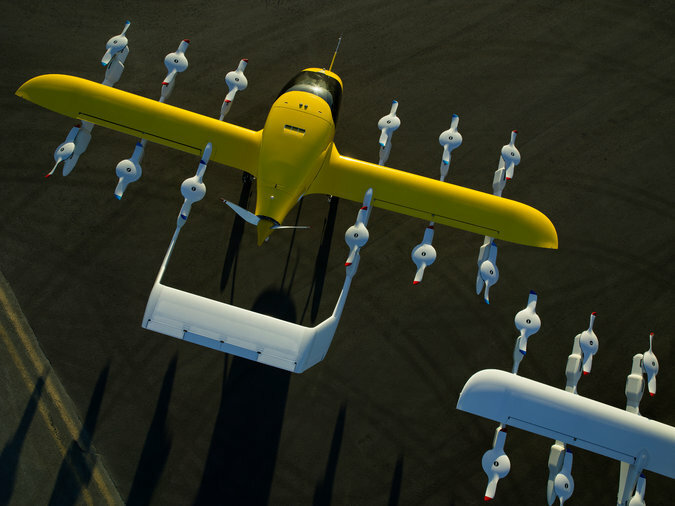 Flight tests are the next major step in development, though NASA has yet to plan them. The Kilopower generator is optimized for use on surface missions, but officials at the news conference said it could also be used to power ion propulsion systems or be included on the Lunar Orbital Platform-Gateway, a proposed outpost for astronauts positioned in the space near Earth's moon. The United Launch Alliance Atlas V rocket carrying NASA's InSight Mars soars into space after launching from Vandenberg Air Force Base in California before dawn on May 5, 2018. "Ultraprecise" is no exaggeration: SEIS will be capable of spotting vibrations smaller than a hydrogen atom, mission team members have said. The instrument must, therefore, be encased in a vacuum chamber, so its observations aren't swamped by environmental noise. SpaceX is readying an upgraded version of its Falcon 9 rocket for launch Thursday -- the first of its kind. The "block 5" version of the booster incorporates numerous design changes to improve performance and safety, while allowing the company to refly first stages 10 times or more. The launch Thursday will boost Bangladesh's first communications satellite into orbit. Along with helping SpaceX streamline launch operations, the block 5 booster eventually will be used to launch astronauts to the International Space Station as well as high-priority national security payloads for the Pentagon. The block 5 upgrades are designed to meet the stringent safety requirements for such missions. Following a first stage engine test firing last week, the revamped booster's first flight is targeted for liftoff from historic pad 39A at the Kennedy Space Center at 4:42 p.m. EDT (GMT-4) Thursday. Forecasters are predicting an 80 percent chance of acceptable weather. The goal of the flight is to launch the Bangabandhu 1 communications satellite, built by Thales Alenia Space in France to provide Ku-band and C-band television and data services across Bangladesh. Once in orbit and checked out by Thales, the satellite will be operated by the Bangladesh Telecommunication Regulatory Commission. LONDON (Reuters) - A global team of scientists plans to scour the icy depths of Loch Ness next month using environmental DNA (eDNA) in an experiment that may discover whether Scotland’s fabled monster really does, or did, exist. An amazing new animation on Twitter shows the view from the European Space Agency's (ESA) Rosetta spacecraft. It visited a comet between 2014 and 2016. What age is this we’re living in?! The discovery that blue-green algae can photosynthesise in extremely low light has implications for astrobiology. Andrew Masterson reports. Krausz and his colleagues, however, found that C. thermalis continued to photosynthesise at wavelengths up to 750 nanometres. The finding not only represents a significant extension of the low-light photosynthesis limit, but also describes a system that can function using much less biological fuel. The researchers call it an “unprecedented low-energy photosystem”. The key, the scientists discovered, lies in the presence of previously undetected long-wavelength chlorophylls, which perform the necessary charge separation. The researchers traced the origin of these chlorophylls back to the C. thermalis genome, and discovered that it was located in a specific gene cluster that is common in many cyanobacterial species – suggesting that the ability to surpass the red limit is common. To Krausz this low-light ability holds promise for the use of cyanobacteria as frontline terraforming agents. Establishing colonies on other planets would set in motion an atmospheric transformation that should – eventually – result in human-friendly conditions. Of course, if some astrobiological theories are correct, cyanobacteria (or, at least, similar lifeforms) may already exist on other planets – in which case their ability to survive in harsh low-light conditions suggests a new target for detection. “This might sound like science fiction, but space agencies and private companies around the world are actively trying to turn this aspiration into reality in the not-too-distant future,” says Krausz. “Photosynthesis could theoretically be harnessed with these types of organisms to create air for humans to breathe on Mars. The world's smallest computer next to a grain of rice. Where do I plug in my 49" curved monitor panel?